One of the most common questions I receive is about the Fed Policy to buy Treasuries and is this not inflationary? This is a complex topic. Most of what is floating around on the web is half-truth largely due to the fact that everyone still sees this as a Fish Bowl Economy. The basic assumption that even the Fed makes which is dead wrong, is that the economy is entirely self-contained. They actually believe that they can “stimulate” the economy through purchasing government securities from the open market and that will increase the money supply within the DOMESTIC system – the Fish Bowl. They completely fail to understand that we live in a global economy. There are TWO huge problems here with this reasoning that demonstrates why you should NEVER hire anyone who ever had any connection to these wild theories. (1) The assumption is that by purchasing government securities they will put more cash back into the system “stimulating” the demand and rekindle the flames of the economy. That requires that CONFIDENCE remains intact – a huge assumption. It also assumes that any such “stimulus” will be directed at the local economy exclusively! A) Even assuming an EXCLUSIVE domestic economy, the falsehood here is the presumption that this method is somehow “direct” and confined only to the local economy when at best it is “indirect” with no guarantees where it will end-up. This is like the Roman Emperor Constantius II riding in his chariot and throwing gold coins to the crowd with no idea if it reached the needy people as he is shown presuming he gave to the poor. 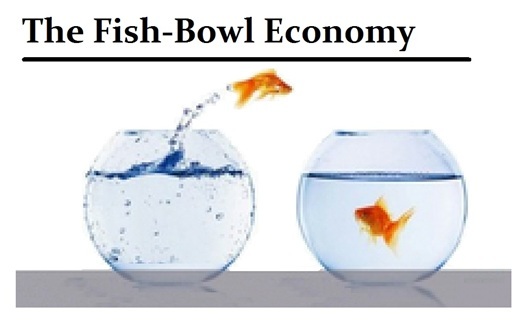 (2) That the economy is simply like a fish bowl and entirely self-contained without any external influences. 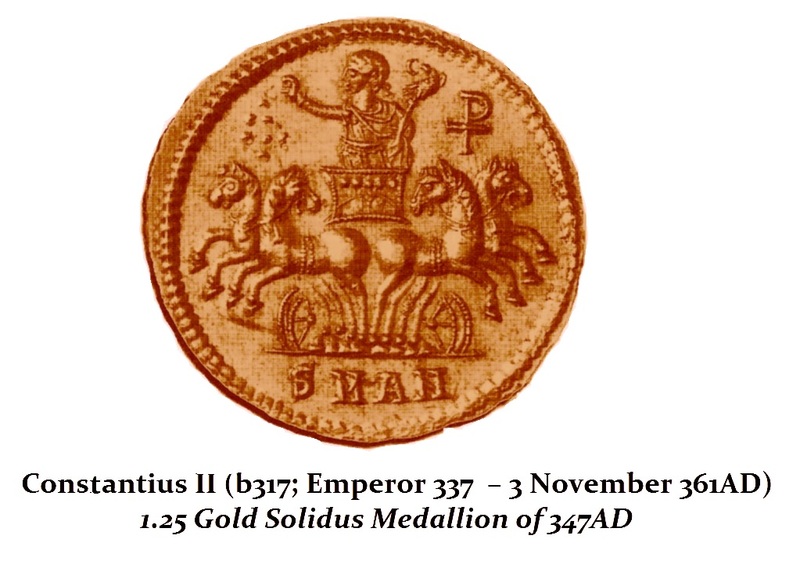 Thus you add to the money supply or you take away from it without ever considering what is really taking place. 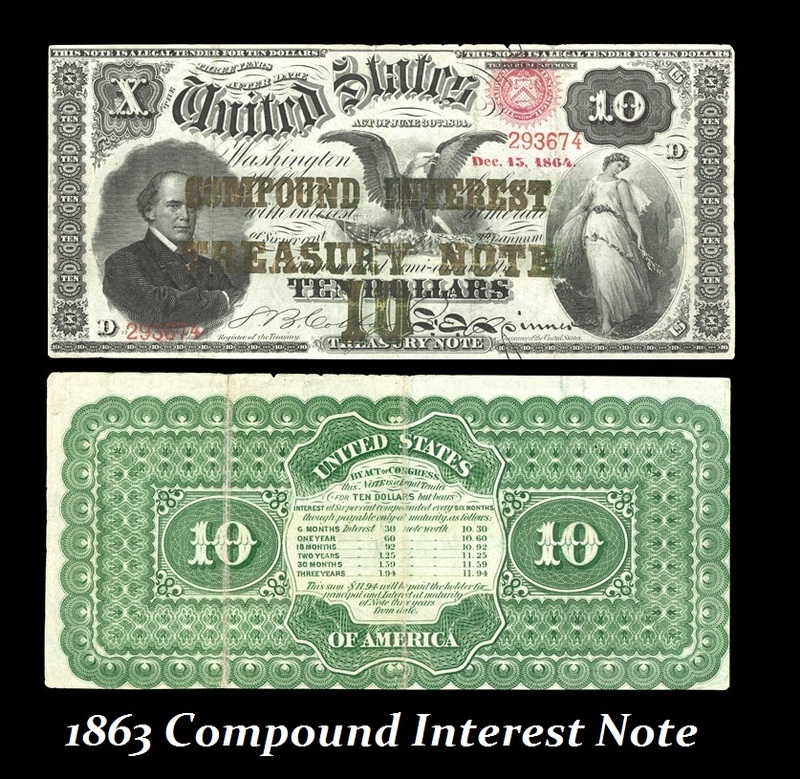 A) Ignored is the ability of foreign holders to sell their bonds which becomes deflationary domestically because the “cash” being returned to the fish-bowl is actually exported having ABSOLUTELY NO domestic stimulus and indeed results in the global contraction in real money supply of the acting nation. The Fed OMC statement portrays how they manage the economy and thus has revealed that indeed they lost all touch with the modern global economy that has evolved. YES it would be “inflationary” if the purchase would be EXCLUSIVELY from domestic sources and the local money supply would be increased. However, when they are buying in debt the seller could be easily a foreign holder. If the Fed creates cash, it will have no effect domestically if China was the seller. 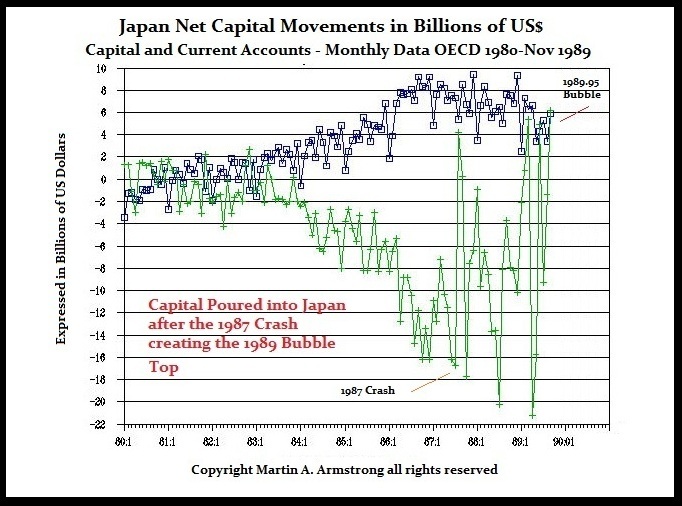 The cash is exported as illustrated during the 1987 Crash showing the massive exit of Japanese cash from US markets. Today, 40% of interest is paid out goes overseas. So even the theory that it is less inflationary to borrow than print becomes absurd, for we are NOT borrowing from ourselves and we are not “stimulating” the domestic economy when 40% of the interest is paid overseas to foreign holders. 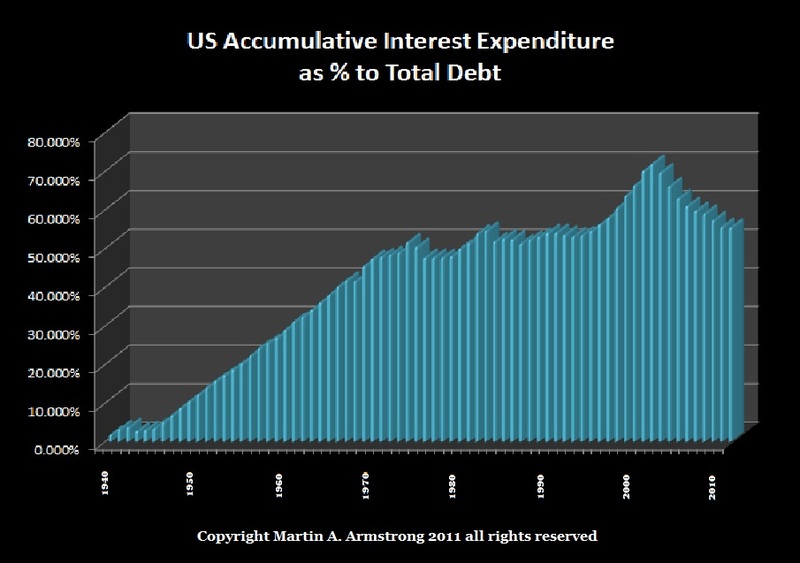 Almost 70% of the entire national debt is accumulative interest payments. Because the dollar is the “reserve currency” it is held by central banks worldwide. In reality, we are back to how paper money was first introduced in 1863 – it paid interest as an incentive to cause it to be accepted. Consequently, the whole theory employed to “stimulate” the economy does not even match the real monetary system we have today. The dollar is NOT being printed – it is predominately electronic and bonds, where the latter pays interest and this is exponentially advancing the overall growth of the national debt. Only a moron cannot see what is happening. The bulk of dollars being created are through the issue of debt, and they once again pay interest. So at first blush, yes it appears as if the Fed buys back federal debt creating cash, it would be inflationary. But we no longer live in a fish bowl and other fish have figured out how to jump into our bowl and then also jump back out. This can also DRAIN the domestic economy creating STAGFLATION where the money supply grows, prices increase, but the productive forces dwindle. The Fed by buying back Federal debt, it is reducing the interest expenditures pay to the private sector and foreign holders. In reality, they are shrinking the velocity of money when they are hoping to increase it when in fact the bonds being sold to them come from overseas. We have to pay close attention to how the economy has changed dramatically from what is being preached. Surviving your own trading decisions is the real challenge. That is your real enemy, not the opinions that will turn very negative in 2013.